The Pennsylvania Department of Health have announced the names of 12 groups that were awarded medical marijuana grower-processor permits. The state is divided into six regions, with two permits allocated in each region. Prime Wellness LLC of Sinking Spring and Franklin Labs LLC of Reading received the permits in the Southeast region. They are both in Berks County. No facility was approved in Philadelphia. Over 500 applicants vied for the permits. They have 6 months to get their operations running. Each facility must be indoors and secure. The list of approved dispensaries will be announced later this month. There will be 27 permits issued. Pennsylvania's medical marijuana program is scheduled to begin next year. 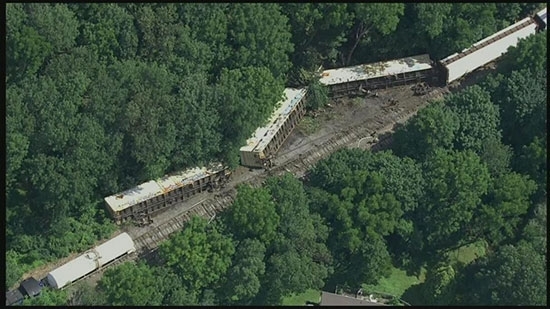 A train carrying butter slipped off the tracks in Sellersville, Bucks County this afternoon. It happened before 3 p.m. near Jessica Lane. Three refrigerated cars carrying butter fell off the tracks and tipped over, spilling their contents. There have been no reported injuries. The train had 23 cars in total. Crews are working to clean up the area. Investigators are trying to determine what caused the cars to fall off the tracks. Pennsylvania State Police and the Bomb Squad are investigating possible explosives at a home in Bucks County. Hazardous chemicals were found at a home on the 8700 block of Easton Road in Ottsville around 2 p.m. Tuesday. No injuries have been reported. The National Weather Service confirmed. that a tornado touched down in Sussex County, Delaware, on Monday evening. There were no injuries but multiple buildings sustained damage in the Greenwood area.